It doesn't matter what kind of phone you have: your photos and videos would no doubt benefit from external lenses and other gear. 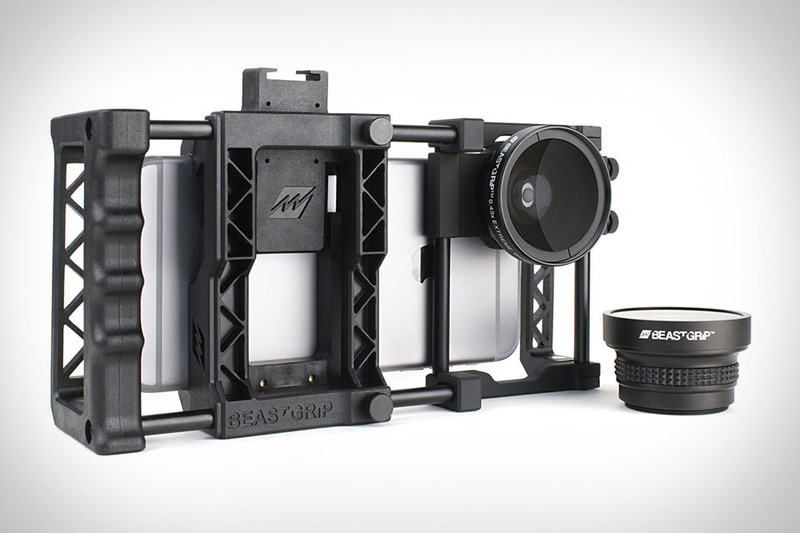 The BeastGrip Phone Camera Rig lets you accessorize as much as you need. The adjustable frame works with nearly any phone, providing a standard 37mm threaded lens and filter mount, compatible with a wide variety of add-ons, notably the included wide angle and fisheye lenses. There's also a cold shoe for attaching lights and mics, and five standard threaded mounts for tripods, stabilizers, sliders, and other supportive accessories. There are plenty of smart thermostats on the market, aimed at helping you save on your bills. But your furnace isn't the only thing sucking up energy. The Sense Home Energy Monitor tracks every appliance, light, and electronic to help create a more efficient home. It connects to your electric panel and collects current sensors that are sent to your main breaker from the different devices plugged into your house. It then itemizes your usage on their smartphone app to let you know where all of your energy is going. The monitor will even let you know how your household stacks up against your neighbors, if your garage door is open, when the dryer is done, and the embarrassing amount of hours you spent binging on Netflix this week. Seem impossibly cheap for a 3D printer? That's because it is. The Ultimaker 3D Printer Backpack doesn't actually include the company's $1,200 Ultimaker 2 Go printer. But it does make it easy to carry one around. Both the backpack and the printer are light, so it's not much strain on your back, the interior has space for tools, and it's quite rugged, so you can take it on a bike/subway/plane with confidence that you'll look like the super nerd of all super nerds. When you're outdoors and on the move, it's less than ideal to pull out your phone in order to keep track of your group. The Bonx Wearable Walkie Talkie gets around this by pairing with your phone and letting you talk to your team with a single button press. Its oversized button is easy to tap, its wraparound design ensures it stays in place, and its water- and shock-resistant body lets it stand up to whatever you throw at it. Regular old Dropcams are great, but even after they got bought out, there remains one big problem: they have to stay indoors. The Nest Outdoor Camera does away with that. Its weatherproof body can handle anything the clouds throw at it, it plugs in, so there's no worries of dead batteries, and it has a built-in speaker and mic so you can communicate with unwanted visitors or just tell the delivery guy to leave the box on the steps. And like all Nest cams, it can record up to 30 days of footage to the cloud, and sends alerts to your phone if it thinks something's up. Designers love finding great new typefaces and color palettes. But it can be difficult to match what you find out in the world to what you're trying to create on your computer. The Spector Typeface & Color Collector is designed to bridge this gap. 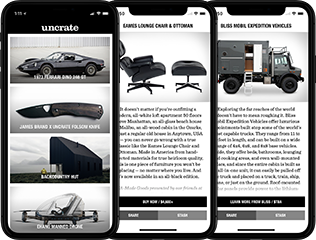 It communicates with apps like InDesign, Photoshop, and Pages via a plugin, sending over both the typeface and the size in real time. In addition, it can detect colors, and give specific CMYK, RGB, and Pantone values. And since much of your discovery happens away from your desk, it can store both type and color information for use when you return to work. Unfortunately just a working prototype for now, hopefully it will be available for purchase soon. It would be amazing if our phones spit out photos just like a Polaroid. Until that happens, the Fujifilm Instax Share SP-2 Smartphone Printer is the next closest thing. Faster than its predecessor, it can print a photo in as little as 10 seconds, connecting to your phone via Wi-Fi. Via the overhauled app, you can adjust things like brightness, contrast, and saturation before printing, apply filters, and create collages before you print out your 2" by 3" masterpiece.